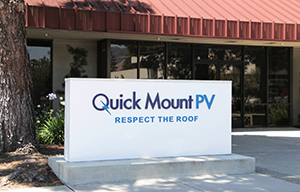 Quick Mount PV is the nation's leading manufacturer of solar panel roof mounts. The company is dedicated to sustainable business practices, training and education, and quality manufacturing in the USA. Join our dedicated team of people committed to green practices and creating a fun and healthy work environment. We’re looking for like-minded individuals to help us build a brighter future. The Inside Sales Representative works out of our Walnut Creek office and is primarily responsible for selling corporate products through a distribution network to solar contractors. The ideal candidate has a positive attitude, and the ability to build strong relationships with customers and coworkers while diligently expanding Quick Mount PV’s network of influence and leverage her or his expertise to continually promote the company’s products and values. Reports to the Manager of Sales Operations. This is a full-time, salaried position with competitive pay and comprehensive benefits package including health, dental, vision and matching 401K program. Our Inventory Control Specialist position is a great opportunity to come work for the fast-growing solar industry and help clean power grow across America. You will be responsible to coordinate and execute inventory counts using a cycle count method, investigating/resolving discrepancies between the physical and electronic inventory records and record adjustments based on reconciliation process. This is a full-time, hourly position with competitive pay and comprehensive benefits package including health, dental, vision and matching 401K program. We are searching for a candidate who resides in and is able to travel within the entire territory. Territory includes NY, MA, PA, NJ, CT, MD, and DE. The Territory Sales Manager is responsible for the performance of their identified geographical sales territory, with a primary focus on creating demand for Quick Mount PV products at the installer level as well as servicing the needs of Distribution Partners. He/she will be able to utilize prior knowledge of Residential PV installation techniques with the people skills necessary in an outside sales position. This remote position requires a home office and travel to meet with clients. Leads are provided from the company and TSM’s are also responsible for generating their own. Attend sales meetings and regional / national conferences. Must be able to work in a fast paced environment, communicate to external and internal professional individuals and organizations, multi-task, self-starter, work with little supervision, and uphold a professional demeanor. This is a full-time, salaried position with attractive base compensation plus great commission system and comprehensive benefits package including health, dental, vision and matching 401K program. Our Systems Administrator position is a great opportunity to come work in the fast-growing solar industry. Here at Quick Mount PV in Walnut Creek, CA, you’ll work as part of a small team to ensure that our network, server, and software infrastructure meet the needs of our mid-sized organization. The position entails working with new technology from Cisco, Nutanix, and more! Our candidate will enjoy strong project ownership, a relaxed work environment, and helping clean power grow across America!